New recommendations aim to increase the safety of anesthesia for feline patients. Because of their small size, species-specific physiology, and often undiagnosed comor­bidities, cats have higher anesthesia-related mortality than dogs. Although studies evaluating factors associated with anesthetic risk in cats exist, evidence-based recommendations improve outcomes are lacking. The guidelines repeatedly emphasize that reduction of patient fear is a key component of successful anes­thetic outcomes. Recommendations include using pre-visit sedation with gabapentin, feline-friendly handling, and housing that includes a hiding place. Fear can impede the clinician’s ability to perform a complete physical examination, resulting in missed comorbidities. When the patient’s temperament pre-vents a complete preanesthetic evaluation, postpone­ment of elective procedures is recommended. The panel advocates the use of chemical restraint. The use of sedatives, analgesics, and local anesthetics allows the veterinary team to perform short proce­dures, including diagnostic imaging and wound management, with minimal physical restraint. In the preoperative period, premedications provide sedation to reduce handling stress so that the veteri­nary team can complete important tasks that improve anesthetic safety. Placement of an intravenous catheter allows administration of fluids and emergency medica­tions. Preoxygenation is also strongly recommended, because induction agents have a large respiratory depressive effect in cats. Preoperative testing should be guided by life stage and individual patient characteristics. A chemistry panel, complete blood cell count, urinalysis, and retro­viral testing are recommended for all ages. Thyroid screening should be performed in patients over age 10. Additional preoperative testing may include thoracic radiographs, electrocardiography, blood pressure, and N-terminal pro b-type natriuretic peptide. Thorough preanesthetic evaluation allows the clini­cian to identify comorbidities and create an individ­ualized anesthetic plan. Knowledge of comorbidities allows the team to anticipate possible complications and adjust monitoring and responses accordingly. When possible, comorbidities should be well-con­trolled prior to anesthesia. The guidelines state that “airway-related problems [are] a significant cause of anesthetic-related death and morbidity in cats.” The most common of these complications is obstruction, which can occur during both the perioperative and postoperative periods. Airway protection is usually accomplished with a cuffed ETT. Other components of the feline respiratory system also pose unique challenges. The larynx is prone to spasms and can be damaged easily during intubation. Techniques for atraumatic intubation are outlined and diagrammed in the guidelines. Suggested alternatives to ETT tubes include supraglottic airway devices. Finally, the lungs are highly susceptible to barotrauma from high airflow rates when using nonrebreathing systems. An average cat has a lung capacity of just 400 mL. Every breathing circuit must contain a safety pop-off valve and manometer to protect against high airway pressures. Detailed patient monitoring allows early identification of complications. Study results have shown decreased mortality in veterinary patients with a dedicated anesthetist.3 Monitoring should include both physical assessment and use of equip­ment to track parameters of circulation (pulse, blood pressure, heart rate, rhythm), oxygenation, ventilation, and body temperature. Close monitoring of the patient should continue throughout the recovery period, because 60% of anes­thetic-related deaths in cats occur during the first 3 hours after surgery. 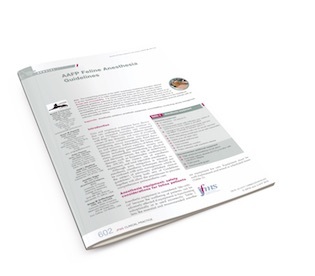 The 2018 AAFP Feline Anesthesia Guidelines are the first of their kind. They identify common anes­thetic complications in cats and offer solutions to minimize risk and reduce mortality. These recom­mendations should be used in conjunction with previously published guidelines, such as those on pain management. Dr. Boatright, a 2013 graduate of the University of Pennsylvania, is an associate veterinarian in western Pennsylvania. She is actively involved in her state and local veterinary medical associations and is a former national officer of the Veterinary Business Management Association. Robertson SA, Gogolski SM, Pascoe P, Shafford HL, Sager J, Griffenhagen GM. AAFP feline anesthesia guidelines. J Feline Med Surg. 2018;20(7):602-634. doi: 10.1177/1098612X18781391. Brodbelt DC, Pfeiffer DU, Young LE, Wood JLN. Risk factors for anaesthetic-related death in cats: results from the confidential enquiry into perioperative small animal fatalities (CEPSAF). Br J Anaesth. 2007;99(5):617-623. doi: 10.1093/bja/aem229. Dyson DH, Maxie MG, Schnurr D. Morbidity and mortality associated with anesthetic management in small animal veterinary practice in Ontario. J Am Anim Hosp Assoc. 1998;34(4):325-335. doi: 10.5326/15473317-34-4-325.